During titration experiments you will be using several types of volumetric glass. They all are designed to help measure volume of a liquid. Some types of the volumetric glass can be used only to measure predefined volume of solution. These are volumetric flasks and single volume pipettes. They are characterised by a a high accuracy and repeatability of measurements. Flasks are designed to contain (TC, sometimes marked as IN) known volume of the solution, while pipettes are generally designed to deliver (TD, sometimes marked as EX) known volume (although in some rare cases they can be designed to contain). This is an important distinction - when you empty pipette you deliver exactly required volume and you dont have to worry about the solution that is left on the pipette walls and in pipette tip. At the same time you will never know how much solution was in the pipette. On the contrary, volumetric flask is known to contain required volume, but if you will pour the solution to some other flask you will never know how much of the solution was transferred. Both kinds of glass were designed this way as they serve different purposes. Volumetric flask is used to dilute original sample to known volume, so it is paramount that it contains exact volume. Pipette is used to transfer the solution, so it is important that it delivers known volume. Note, that volumetric pipettes are designed in such a way that after a fluid is dispensed, a small drop of liquid will remain in the tip. In general you should not blow this drop out. The correct volume will be dispensed from the pipette if the side of the tip is touched to the inside wall of the flask (or beaker). Third kind of precise volumetric glass is burette. Burette is used to add titrant to the titrated solution and it has a scale on the side, so that you can precisely measure volume of the added solution. Burette is similar to the pipette, as it is designed to measure volume of the delivered liquid, but it can measure any volume of the solution. Two other types of volumetric glass are graduated pipettes and graduated cylinders. These are too designed to deliver requested amount of solution and they have a scale on the side. However, their accuracy is usually much lower than the accuracy of volumetric glass described above. They are used to measure amounts of auxiliary reagents, like buffers. Usually when measuring volume of the solution, the bottom of the concave meniscus must be precisely on a calibration mark. To make reading of the meniscus position easier we can use piece of paper with a horizontal black stripe, about an inch and half wide. If paper is hold half an inch behind a burette with a stripe about a half an inch below meniscus, solution surface seems to be black and is much easier to see. Reading volume on the graduated pipette (or burette) - 1.4 mL. 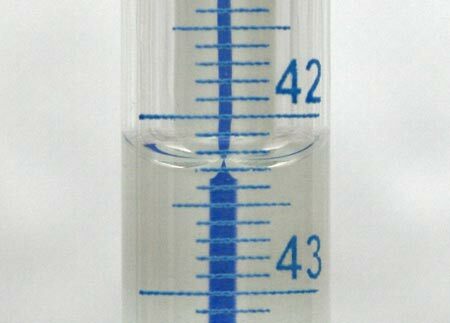 Meniscus surface is in fact a little bit below the 1.4 mL mark, so you may read it as 1.42 mL, assuming it is about 1/5 of the scale distance. So called Schellbach burettes have additional thin, colored line embedded in the glass. This line, when watched through the meniscus, seems to be hourglass shaped - and you should align the thinnest part of the line with the calibration mark. Reading volume on the Schellbach burette - 42.25 mL (that is 42.2 and half of the mark). 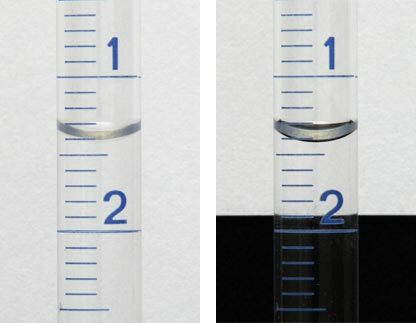 In the case of dark solutions (like permanganate), that won't let you see through, meniscus is invisible, and you should align top of the solution with the calibration mark. For obvious reasons this procedure works only for burettes. Volumetric glassware used in labs can be either A class or B class (or non classified). A class glassware is more accurate. Details are covered in the Standard Specification for Laboratory Glass Graduated Burets (ASTM E287-02). Note that ASTM standards, while adopted worldwide, may be different from your national standards. 1 Minimum delivery time for Class A serialized and non-serialized (maximum delivery time 60 sec). Class B volumetric glassware has ±mL tolerances twice those of Class A glassware. Most popular burettes are 10 mL, 25 mL and 50 mL types. 10 mL burettes are usually graduated each 0.05 mL, while 25 mL and 50 mL burettes are usually graduated each 0.1 mL. That means that 50 mL burettes have the highest resolution. 0.050 mL out of 50 mL is 0.1%, and that's about maximum precision that we can get from volume measurement when using burette. In turn that's also about the maximum precision of the titration. We will use these numbers - 50 mL burette, 0.050 mL volume, 0.1% accuracy - throughout the site, when discussing different aspects of titration. It can be interesting to check relative accuracies of volumetric glass calculated wih the use of the tolerances data. Relative errors for burettes are calculated assuming 80% of the burette volume was used during titration. There is one, obvious conclusion form the table - the lower the volume of glasware, the higher the relative error. Thus, for high precision work we should use glassware of higher volume. As it often happens, this is not a rule to be followed blindly - in the case of small samples large volumes mean dilution, which in turn may mean problems with the end point detection, or larger distance between end point and equivalence point. Note, that for really precise applications you should calibrate pipette and volumetric flask. This is done by precisely weighing water dispensed from the pipette and weighing empty and full flask. Depending on the glass class difference between nominal and real volume can be neglected or have to be taken into account when calculating titration result. Some examples of the markings on the volumetric glassware follows. Note, that these pictures were taken in the lab in Poland, using glass made according to local standards. These are similar, but different from ASTM E287-02. 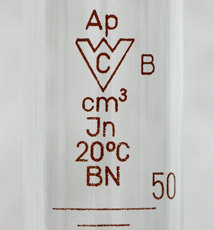 Markings on the B class volumetric flask. Flask is calibrated to contain (In) 1000±0.80 mL of liquid at 20 °C. According to ASTM E287-02, tolerance of A class 1000 mL volumetric flask should be ±0.300, that means ±0.600 for B class flask (twice A class tolerance). However, this flask is marked DIN - Deutsches Institut für Normung - and DIN standard is slightly different. Markings on the volumetric cylinder. B to the right means B class, calibrated to contain (In) at 20°C. No idea why this cylinder is calibrated to contain. Markings on the B class 10 mL pipette. Calibrated to deliver (Ex) at 20°C. Once again tolerance slightly differs - according to ASTM E287-02 it should be ±0.04. Markings on the A class single volume pipette. Calibrated to deliver (Ex) 15 mL ±0.03 at 20°C, you should wait for at least 15 seconds, touching side of the pipette tip to the inside of the flask (beaker) till solution is delivered. Page was last modified on June 17 2009, 12:07:29.